It's hard to resist getting excited when the holidays arrive, wouldn't you agree? There is the change of season, delicious food, festive decorations, and most importantly, time spent with family and friends. 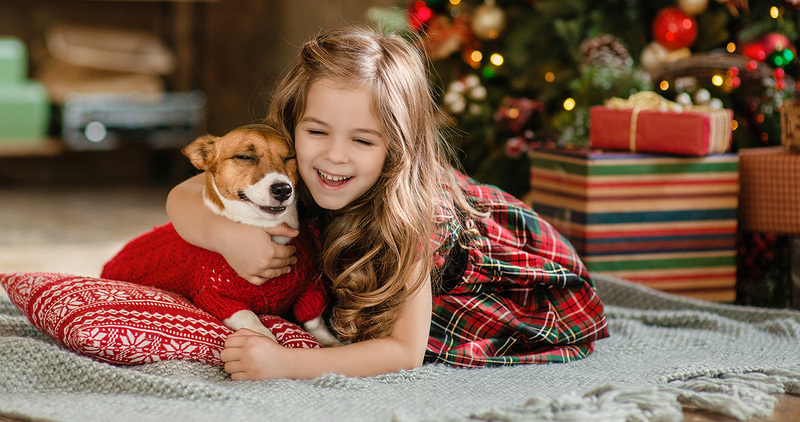 Unfortunately, with the hustle and bustle of the holidays, sometimes it can be a challenge keeping your pet's well being at the forefront of your mind. Read our quick tips below to ensure the holidays are not only a fun time of year, but are just as safe by taking precautionary measures with food, decorations, weather and more. It's no surprise chocolate is first on the list and the reason is because pets can't metabolize the theobromine in chocolate. Even small amounts of chocolate may lead to severe digestive upset, neurological reactions including hyperactivity, elevated heart rate, arrhythmias, and even seizures. If chocolate is ingested, within the first few hours vomiting can be induced with hydrogen peroxide or with apomorphine at your veterinarian's office. Supportive care may include IV fluids and anticonvulsant medications may be needed at the veterinary hospital. Although it may be tempting to give your pet a cooked turkey, lamb or ham bone, such activities should be avoided. These bones may splinter into small pieces in the digestive tract, leading to potential health- or-life threatening obstruction or perforation. Instead, consider dental chew treats, such as Greenies. Feeding your pet food with seasonings such as garlic or onions can be toxic even in small amounts and can potentially lead to low red blood cell counts and anemia. Pet owners should also avoid feeding excessive fatty table foods to avoid potentially serious digestive upset, as well as health-threatening pancreatitis. The best way to prevent accidental ingestion is to secure lids on garbage cans and keep food out of your pet's accessibility. To prevent tipping and falling, consider anchoring your Christmas tree to the wall. Avoid using plants such as holly and mistletoe, which may cause cardiac disturbances and digestive upset. Safer options while still being festive are artificial plants. When decorating the tree, place all breakable or dangerous ornaments toward the top of the tree. 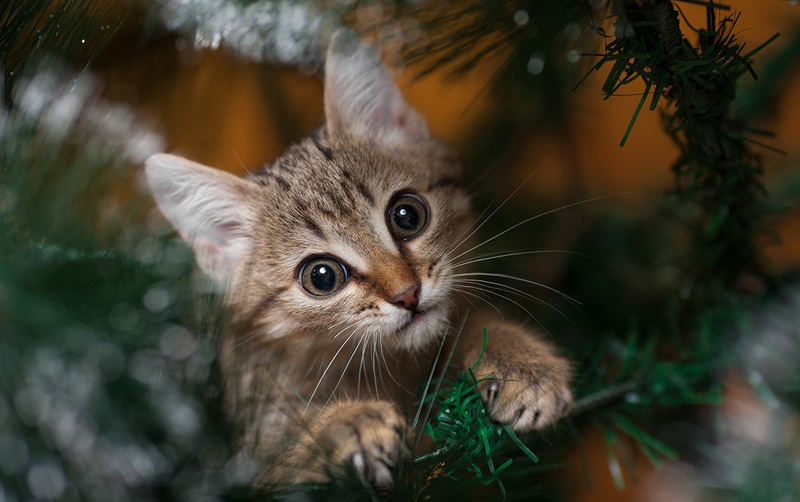 Tinsel, yarn, and ribbon can be especially dangerous to curious dogs and cats. Don't leave lighted candles unattended as pets may burn themselves or cause a fire if these are knocked over. To avoid potential dangers keep wires and batteries out of your pet's reach. 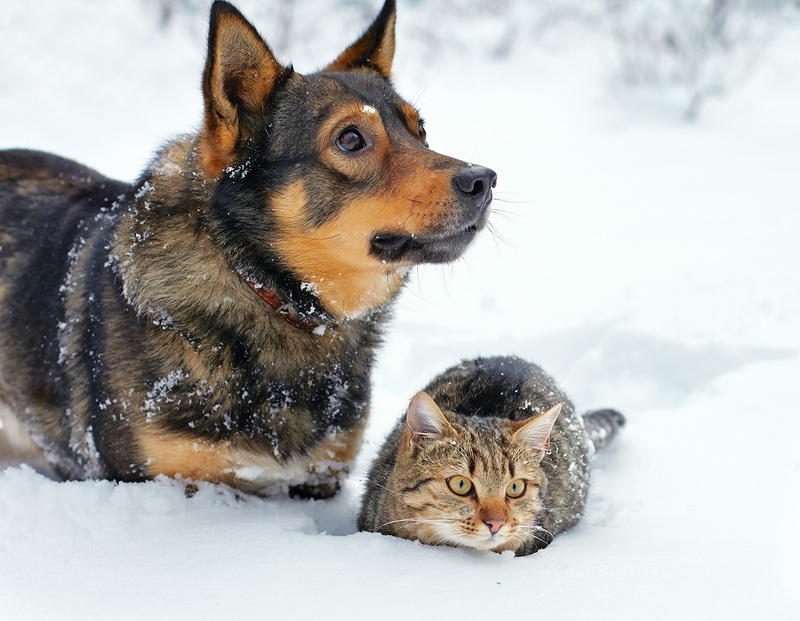 Cats and small dogs that have to wade shoulder-deep in the snow will feel the cold much sooner than larger animals. No pet should stay outside for unlimited amounts of time in cold weather because of frostbite and hypothermia. For indoor use, consider giving your pet a heated pet bed to help him or her stay warm. During outdoor walks it's possible for your pet's paw pads to come into contact with rock salt, ice and chemical ice. To keep paw pads from becoming chapped and raw, wipe your pet's feet with a warm washcloth. During the holidays homes are often filled with additional family members and friends. This can create a crowded and noisy atmosphere, which can be overwhelming to both dogs and cats. To help ease your pet's anxiousness, make sure your pet has his or her own "space" to retreat from excessive noise and commotion. Crates, play pens, and pet gates are perfect options to ensure your pet is safe when guests are over. In addition, calming collars such as Adaptil Collar for Dogs or Sentry Calming Collar for Cats can also help ease nervousness.